How do you recognize a brand? By its logo, the tagline, the brand name, or its colors? Bingo, if you said, all of the above! 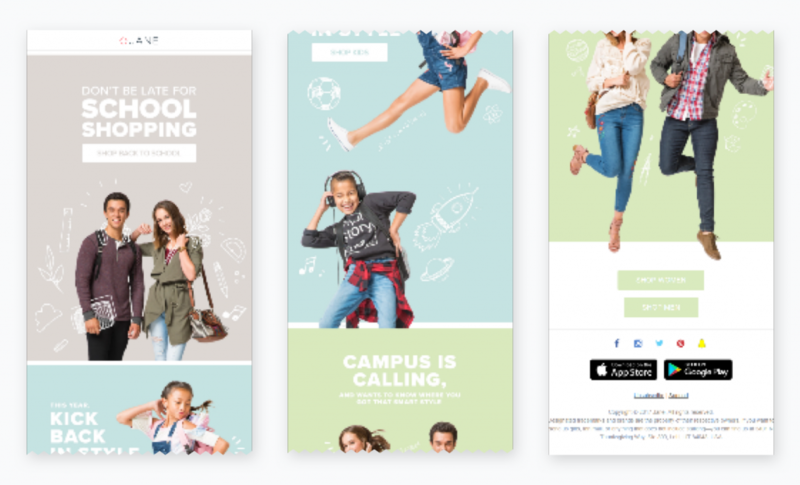 Most people have an extremely cluttered inbox and for your brand to stand out, you’re going to have to combine eye-catching design with great email copy. If you own an e-commerce business and use email as a marketing tool, then you need to reflect your brand’s personality in your emails. Your branding lies in the alignment of your text, the colors, the headers and footers, the typography and fonts you use, the way you write the copy, everything! Consistency is the key to creating a brand identity. 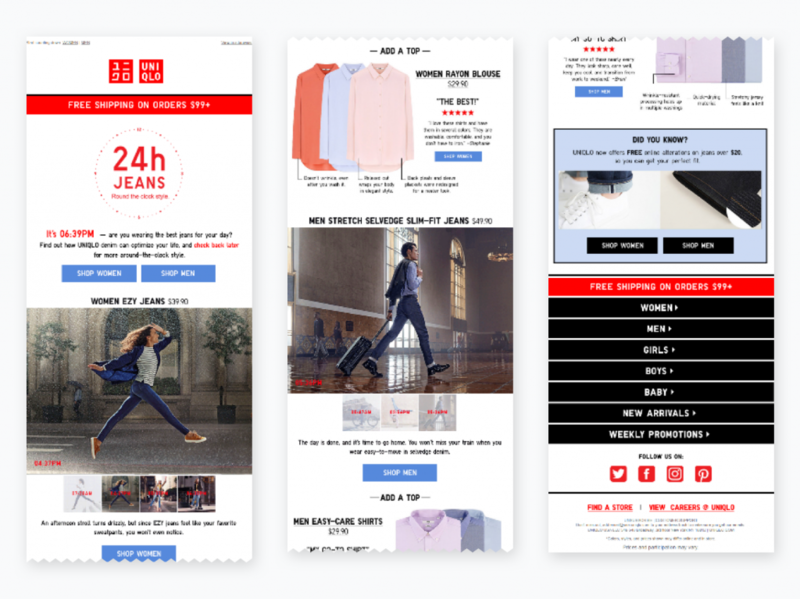 Here are some email marketing best practices from 10 popular e-commerce brands. The logo or name of your brand is the first thing that readers should see when they open your email in their inbox. Your subscribers will recognize your brand first and foremost from your logo. That’s why include your logo at the top of the email. 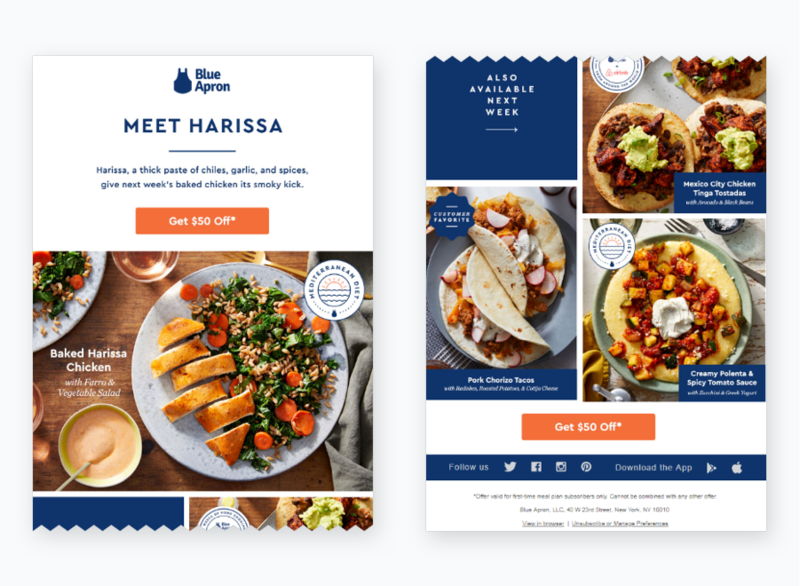 Take a look at this example from Blue Apron. The brand logo is placed right at the top, in a way that it is the first thing that catches the subscribers’ attention and its brand color is maintained throughout the email, for the subscribers to identify and connect easily. Going offbeat and using unique typography and colors will help your brand in grabbing eyeballs. Use vibrant colors and creative fonts but ensure that it goes well with your brand’s personality. Once you choose the appropriate typefaces, use them consistently in all the emails you send. Tiff: Tiff is a web app that lets you compare how different typefaces look and shows the differences between different fonts. This helps you in choosing the right font for your emails. Fontroid: If you want to add a font of your own, then Fontroid is the right Android app for you. This app lets you add your own handwritten fonts, which can be further added to your emails in the form of images. Typecast: This app lets you use Google fonts for your emails to build readable and clear typefaces. You can choose any Google fonts using this app and then add them to your emails. PicLab: With PicLab, you can add creative fonts and typefaces to your images, to make them look more appealing and attractive. Fontest: This is a typography tool that lets you add fonts of your choice and preview them before adding it to your images or text. Though these apps and tools let you experiment with your fonts and typefaces, make sure you add proper fallbacks to these fonts. Email clients render fonts based on their presence on the device. So, emails that look picture-perfect at your end might fail to render at the subscribers’ end. To avoid such renderability issues, you need to set three levels of fallback in your emails. The main font would be your original custom font, the second fallback font needs to be a web-safe font and the third fallback font has to be a system-based font which will render anyhow. 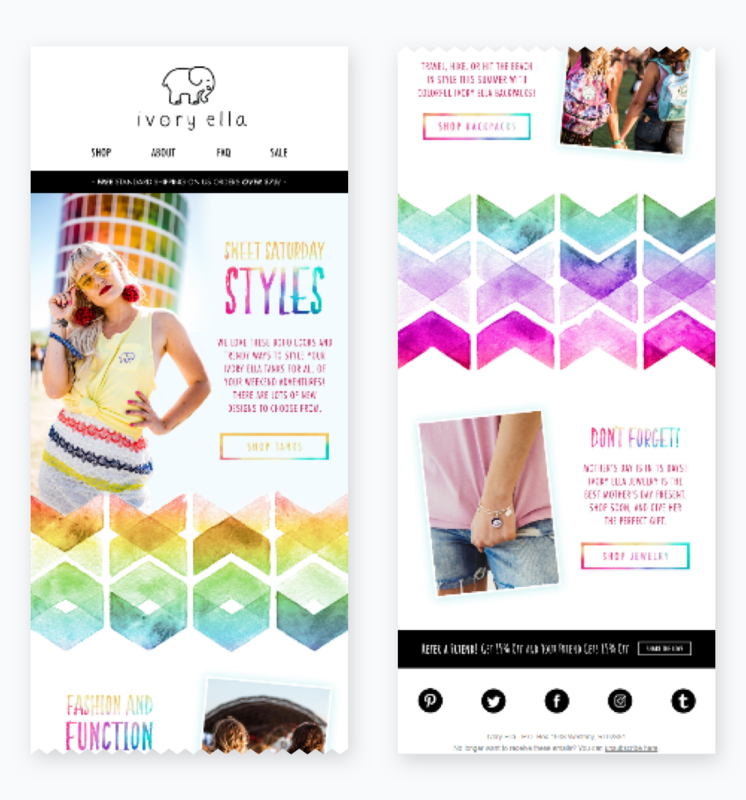 The brand Ivory Ella creates brilliant emails with stylish fonts and vibrant colors. The multi-colored images and typography reflect the youthfulness of the brand and maintain the brand’s identity. Your emails should be able to persuade the subscribers to click-through and take some action. For this, you need to have strong and prominent calls-to-action in your email. Highlight the CTAs using the right colors, most preferably the brand colors to make them evident. Colors influence emotions of the readers. For example, the color Red evokes a sense of urgency, Orange depicts a positive attitude, Yellow stimulates the viewers, Blue builds trust, Green shows growth and harmony and Black depicts elegance and authority. Choose the perfect color scheme that best suits your message and branding and make your CTAs more persuasive. Place the CTA in the first fold so that it doesn’t go unnoticed. 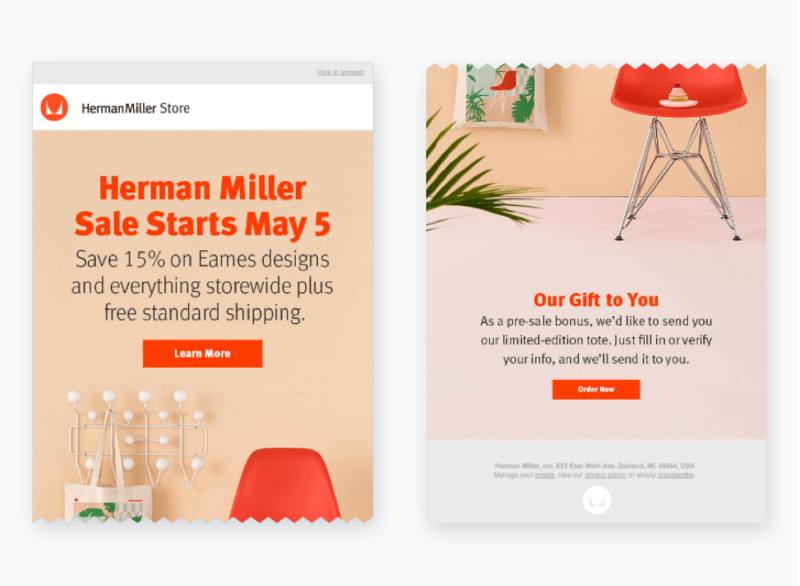 Check out this email from HermanMiller Store. The brand uses its original color for the CTA.The entire email has a light background and the CTA button stands out. Nobody likes to get their inbox flooded with emails that are of no use to them and that they did not opt for. To avoid a negative impact on your brand and to follow the GDPR rule, practice permission-based marketing. You can ask your subscribers to set email preferences, and you must give them the option to unsubscribe whenever they want. This will improve the credibility of your brand. Here’s an email marketing best practice of how Bespoke Post gives the subscribers an option to enter preferences to receive only relevant emails with customized content. The design of your email is essential to making a positive and memorable impact on your subscribers. Make sure you make your emails look attractive and intriguing by using the most suitable email design elements such as illustrations, real images, flat design, right colors and interactive elements. This email from Jane uses illustrations in this email to make it look distinctive. The email uses pastel colors and contains minimum text, with a highlighted CTA in white. HTML and CSS styles to build custom templates. Ready-to-use templates are easily available with a range of ESPs and email marketing tools. All you need to do is, change the content and images as per your preferences, needs and branding guidelines. 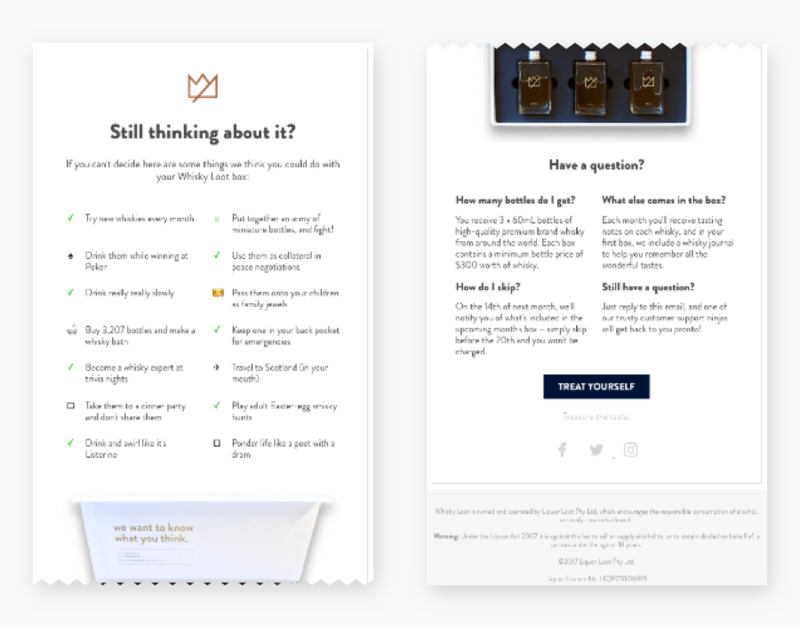 Using these templates will save a lot of time in your email design stage. If you do not find a suitable template for your email, you can hand-code them using HTML and CSS styling. Introducing your brand to those who subscribe to your email list is a great way of welcoming them and letting them know you better. The story of your brand’s journey will help create a great relationship between you and your subscribers. 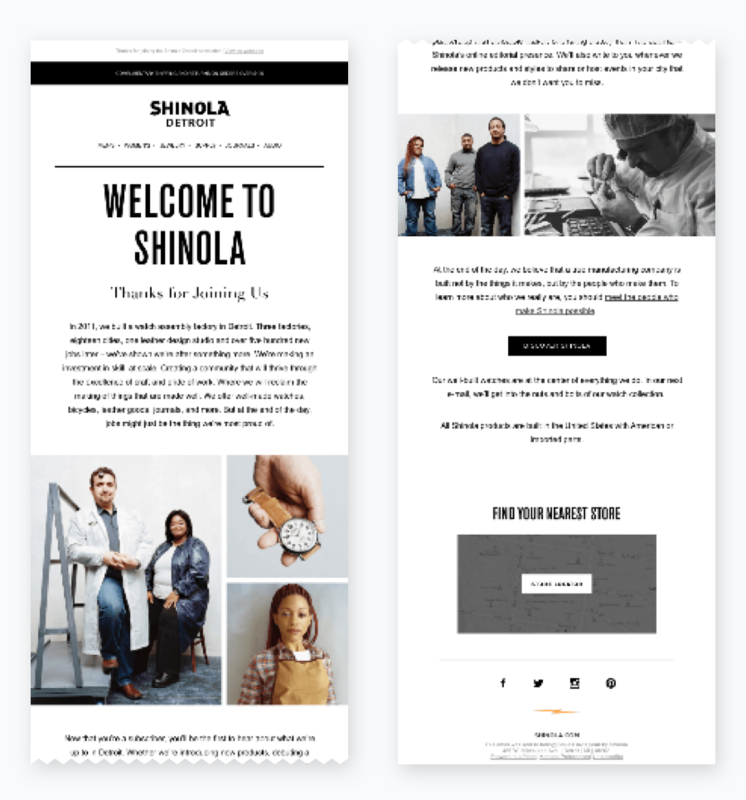 Take a look at this email from Shinola that narrates its brand story in its welcome email. With real images and a detailed story, the email builds trust among its readers. Being present on all popular social media channels is helpful for building your brand identity. So add links to your various social media platforms in every email. 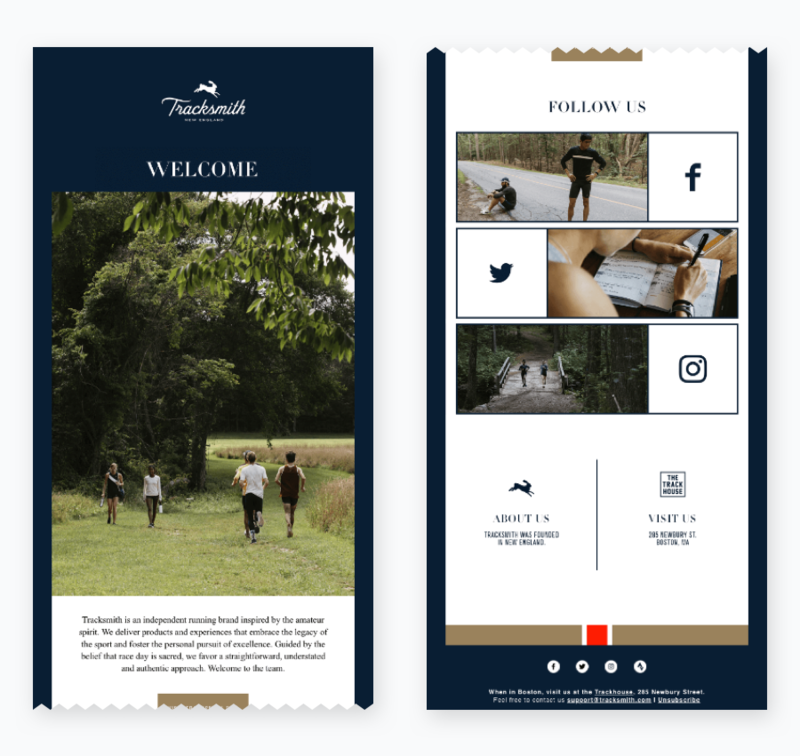 The brand Tracksmith in their welcome email has given links to its Facebook, Twitter and Instagram page. This way, they are making it easy for their subscribers to find them on these channels and connect with them more closely. Creating perfect landing pages for your emails is an essential part of a marketing email as well. Creating synergistic landing pages for your emails establishes a consistent brand experience for your subscribers. 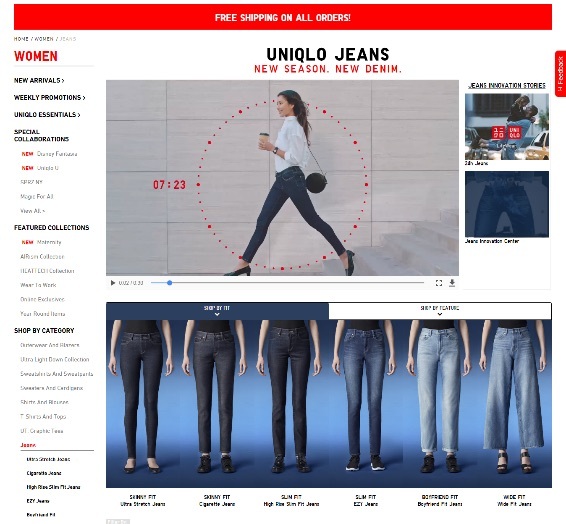 Here’s an email from Uniqlo and its corresponding landing page that has the same images and design layout. The twin-look design makes it easy for the subscribers to recognize and connect with the brand. Using interactive and visual elements according to your brand’s personality will help you to better engage your subscribers. Your subscribers are more likely to engage with your emails and even have prolonged brand recognition when there is some kind of animation or interactivity in your emails. Use interactive elements such as animated GIFs, countdown timers, sliders, menus, rotating banners, accordions, etc. Make sure you use proper fallbacks for the interactive elements as most elements do not render without fallbacks. 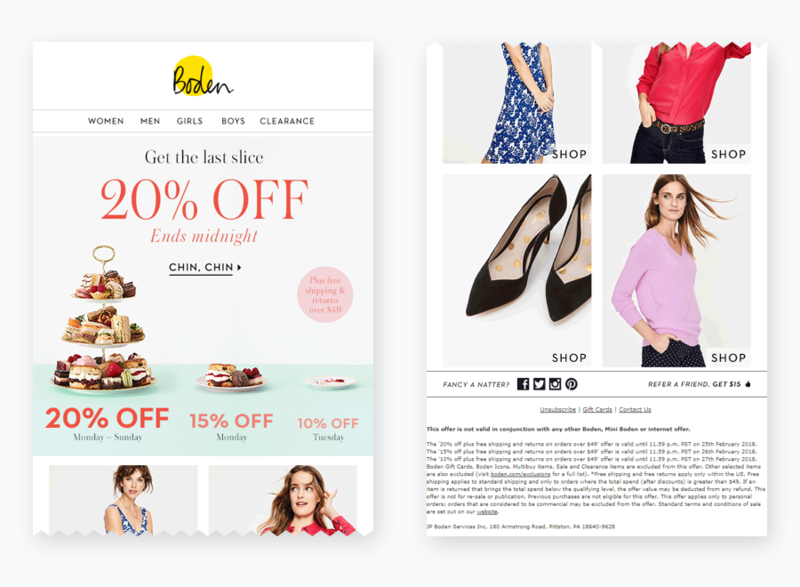 Brands like Boden always use some sort of animation in their emails to make them lively. Your brand’s tone of conveying the message plays a vital role in maintaining the brand personality. Discover innovative ways to write the copy of your email and represent the message in a unique way to stand out in the subscribers’ mind. Write tailor-made content that supports your campaign goals, keeping your segments in mind. Think like your customer and ask yourself questions as to what action do you want your customers to take and what goals you need to achieve from the email. This will help you to write a relevant email copy. Your audience generally skims through your emails, and hence it is necessary that you do the formatting and alignment right. Keep your sentences short and highlight the main points for better readability. Make optimum use of white space and maintain the visual text hierarchy. Check out this email from Whisky Loot. The copy of this email is creative and innovative. This brand follows a similar tone in all the emails that they create. Emphasize your brand logo to be easily identifiable. Use innovative typefaces to make your emails look appealing, but make sure to add proper fallbacks to avoid renderability issues. Make your email CTAs persuasive and prominent. Ask for your subscribers’ permission before sending them emails to maintain the brand credibility. Add interactivity and animation to make your emails lively. Narrate your brand story in your emails to improve relationships with your subscribers. Be present on all major social medium channels to improve brand visibility. 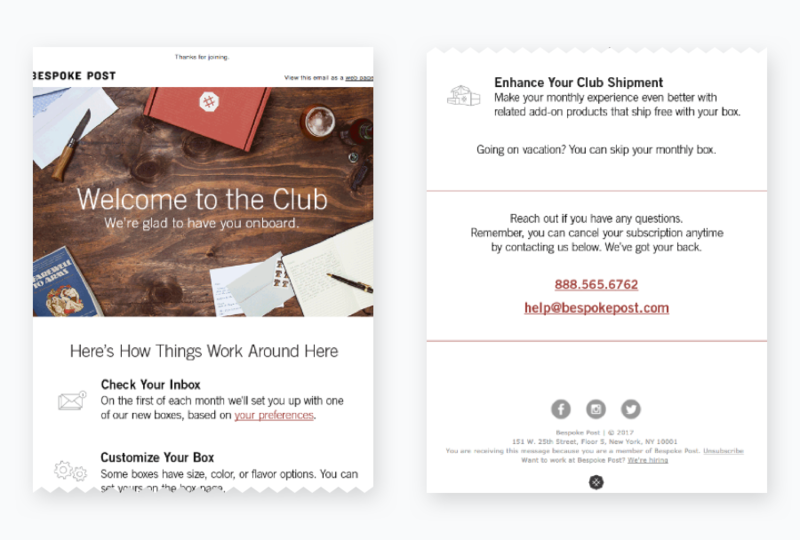 Create similar and consistent landing pages for your emails. Write concise and innovative email copy. I hope the email marketing best practices mentioned above inspired you to create an email campaign that will reflect your brand personality. What is your strategy to stand out in your customers’ mind? Share with us in the comments below.